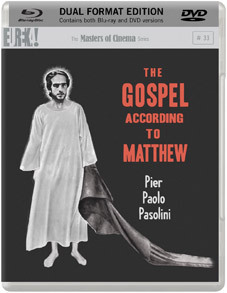 Masters of Cinema have announced that two of Pier Paolo Pasolini's most celebrated works, the 1961 Accattone and the 1964 The Gospel According to St. Matthew (Il vangelo secondo Matteo) will be receiving separate dual format releases (featuring DVD and Blu-ray versions of the films) in March 2012. Accattone will be accompanied by Pasolini's 1964 documentary Comizi d'amore (Love Meetings). The debut feature of Italian filmmaker-novelist-poet-provocateur Pier Paolo Pasolini (Salò, or the 120 Days of Sodom; The Decameron), Accattone rocked the cinema world with its depictions, at once raw and elegant, of the underside of Roman street life – and, in the process, seemed to announce a new direction for Italian films: a neo-neorealism. On the mean streets of Rome, Accattone's eponymous pimp (played by Franco Citti, one of a remarkable cast of local non-professionals) leads a hand-to-mouth existence on the very margins of society: prostituting, scrounging, exploiting. When his prize prostitute Maddalena is arrested and jailed, the pimp's fortunes dwindle, and he is forced to confront his own existence. The work of one of Italy's foremost auteurs, Accattone combines a fascination with poverty, sexual mores, and the entrapments of society, with a sense of humanity and sanctity rarely seen in cinema. 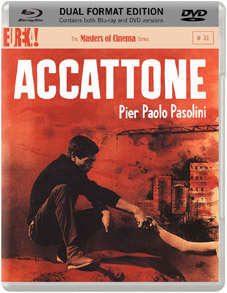 The Masters of Cinema dual format edition of Accattone, which will mark its world debut on Blu-ray, will be released in the UK on 26th March 2012 at the RRP of £23.48. More extras to be announced nearer to the release date. Legendary director (and avowed atheist) Pier Paolo Pasolini's The Gospel According to Matthew is one of the great retellings of the story of Christ – a cinematic rendering (filmed by invitation from the Pope, no less) at once both passionate and poetic. With stunning black-and-white photography, an eclectic soundtrack (Odetta, Bach, a Congolese mass, etc), and using a cast of non-professionals who voice dialogue drawn directly from scripture, the film depicts the key events in the life of Christ, from immaculate conception to death on the cross. Vaunted by the Vatican as one of its select few recommended films, acclaimed by the Archbishop of Canterbury as a "great film", and revered by critics and audiences alike, Pasolini's Oscar-, Golden Lion-, and BAFTA-nominated film remains a magnificent, awe-inspiring experience. The Masters of Cinema dual format release of The Gospel According to St. Matthew will mark the first time the film has appeared on Blu-ray anywhere in the world. It will be released on 26th March 2012 at the RRP of £23.48. Further extras to be announced closer to the release date.